December 7, 1941 - War explodes across the Pacific when the Japanese attack the American fleet at Pearl Harbour. By May 1942, Japan has spread across the Pacific and is threatening America's supply lines to Australia after building an airfield on the island of Guadalcanal. The United States counter with an ill-prepared occupation of Guadalcanal's airfield with the 1st Marine Division. The Japanese retaliate with vengeance, cutting off the Marines by sea and pouring in thousands of Japanese reinforcements. A desperate struggle ensues, as the Americans try to hold on to their tiny foothold against the might of the Japanese Empire. 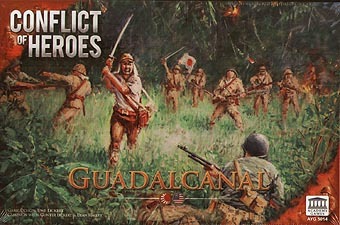 Guadalcanal continues the multi-award winning Conflict of Heroes series. Players command platoons and companies of individual squads and tanks to resolve the same tactical dilemmas that commanders faced during some of the most ferocious engagements of WWII. In Guadalcanal, the Americans track VPs, but the Japanese track Bushido. If a Japanese commander 'loses face' during battle, his command and men's morale can crumble. This is a ground-breaking new concept that forces players to think like their 1942 counterparts. CoH features a fast and fluid system that is easy to learn but realistic to all of the unique theatres of battle portrayed. EASY: Teach a new player how to pay in under 5 minutes. No charts! COUNTERS: Depict individual vehicles, guns, squads, and more. 4 beautiful, highly detailed 15 x 19 inch geomorphic mounted map boards, along with 6 thick double sided terrain overlays. 175 Large Counters - 1" counters depicting Marine squads, Japanese snipers, tanks, anti-tank guns, mortars, MGs, and many more. 1 Firefight Book with a full historical overview and 12 firefights. 1 Rule Book with programmed instruction that teaches the game in small easy to learn steps. 55 Action Cards, 4 Track Sheets - one per player. 2 Summary Sheets, 1 Customized Plastic Storage Tray, 2 Dice.